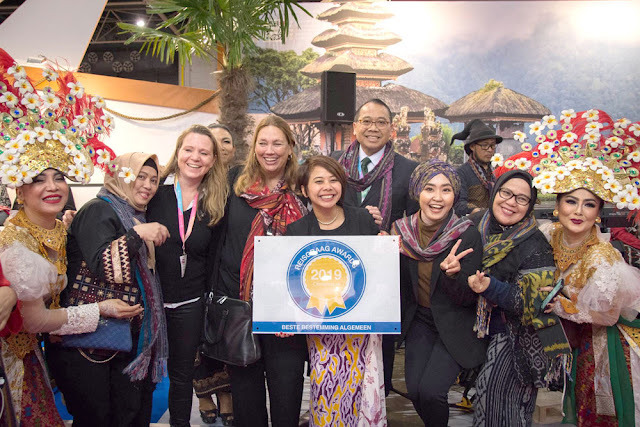 Indonesia has just received a Reisgraag Award for best tourism destination at the ongoing 2019 Vakantiebeurs tourism exhibition, held from Jan. 9 to 13 in Utrecht, the Netherlands. The exhibition committee launched the award comprising several categories in 2011 and this was the first time that Indonesia has received an award there. The Indonesian Tourism Ministry has set up an Indonesian pavilion featuring 21 tourism players comprising travel agents and operators, hotels and accommodation providers, tourism business associations as well as the Garuda Indonesia airline. Indonesia’s participation in the exhibition is a great method to promote the country’s various tourist destinations, as the Vakantiebeurs is known to be the biggest tourism exhibition in the Benelux, which comprises Belgium, the Netherlands and Luxembourg. The event is attended by hundreds of thousands of visitors annually, as well as covered by around 100 journalists and travel bloggers from across the globe. The pavilion also enables guests to take part in various Indonesian cultural activities and sample various kinds of Indonesian food and beverages. According to Indonesian Ambassador to the Netherlands I Gusti Agung Wesaka Puja, the Indonesian pavilion at the exhibition seeks to introduce all the supporting facilities that tourists will enjoy when they visit Indonesia’s many tourist attractions, available from the westernmost province of Aceh to the easternmost province of Papua. Indonesian Tourism Ministry marketing for European region assistant deputy officer Agustini Rahayu said during the exhibition, Indonesian pavilion participants also informed visitors on the actions that the country had taken to recover its primary tourism destinations that had been impacted by natural disasters recently, such as Lombok in West Nusa Tenggara.